Built Wine Ratchet 4-Piece Set—Red (P/N WR1-RDP). Cut the foil seal with the stainless h..
Cepage Laguiole Waiters Corkscrew Olive Wood (P/N 3310). Made in France, our Cepage Laguiole c..
Classic Argentinean Corkscrew (P/N C9004-E). Made of solid brass and stainless steel, this han..
Costa Brava Seven Piece Professional Gift Set (P/N W-PROF). A premium gift for a premium hoste..
Electric Wine Corkscrew (P/N 17184). Pull corks within seconds using our sleek electric bottle..
Houdini Wine Corkscrew Black Velvet (P/N 2807). The Houdini corkscrew works like magic—p..
LAtelier du Vin Chic Set (P/N 095140-0). The Gard'vin® wine keeper leaves little to ch.. Le Creuset 7-Piece Gift Set (P/N GS-500L-31). The gift set includes: The innovative LM250 .. Le Creuset Activ-Ball Corkscrew Gift Set Cherry (P/N 8337). The Activ-Ball internal flex syste.. 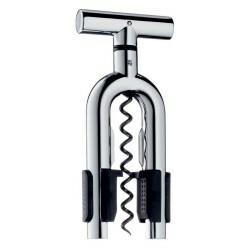 Le Creuset Activ-Ball Metal Corkscrew Blk Nickel (P/N TM300L-50). The Activ-Ball range of cork.. Le Creuset Butlers Friend (P/N PC300L-50). By carefully sliding the prongs between the neck an..
With an easy-to-use handle, turning with just one finger and is small enough to fit in your po.. Le Creuset Waiters Corkscrew Black (P/N WT110L-31). Designed for professional use, the Le Creu.. Le Creuset Waiters Corkscrew Wood (P/N WT110LP-W). Designed for professional use, the Le Creus..
Leather Handle T-Corkscrew (P/N C9002-E). Based on a design from 1876, this corkscrew is handc..
For any wine lover, this tool set features the finest in wine accessories including a cherry wood fi..
Pulltaps Toledo Corkscrew (p/n 5112). Features a unique hinged double-lever system, hardwood i..
Pulltaps Waiters Corkscrew CHROME Boxed (P/N 107-701-01-Chrome, 5151). Features a unique hinge..
Pulltex de Luxe Wine Set (P/N 105607). At a certain point, you want to take your appreciation ..
Rabbit Corkscrew (P/N 6004). Easy to use with an ergonomic design, the Rabbit opens any ..
Rabbit Vertical Corkscrew Black (P/N 6907). The Vertical Rabbit stands up on the wine bottle a..
Rabbit Vertical Corkscrew Red (P/N 6905). The Vertical Rabbit stands up on the wine bottle and..
Rabbit Wine Tool Kit Black (P/N 6010). The Rabbit Corkscrew is the original and still the best..
Rosewood Corkscrew with Leather Pouch (P/N AL3040LAR). The pouch is made of famed Mulholland B..
Screwpull Replacement Worm for LM400 Corkscrew (P/N LM-001). Screwpull Replacement Worm for LM.. Solid Wood Display Stand for Antique Openers (P/N 400). The Antique Opener is constructed from..
As if our exclusive Electric Blue Push-Button Corkscrew weren't amazing enough, our new edition ..